I feel terrible that it took me so long to write a review of this book, seeing as I was sent a copy by Focal Press - but I promise it was only because I intended to use it to make a set of stays and/or corset first! And then, unfortunately, I did next to no sewing since receiving it, and so I'm reviewing from a more theoretical basis. These cover the basic costuming epochs: Revolutionary War, Regency, American Civil War, and bustle periods (right? These seem like the most common genres to me), with a few extras to fill in the holes. So that is very satisfactory! 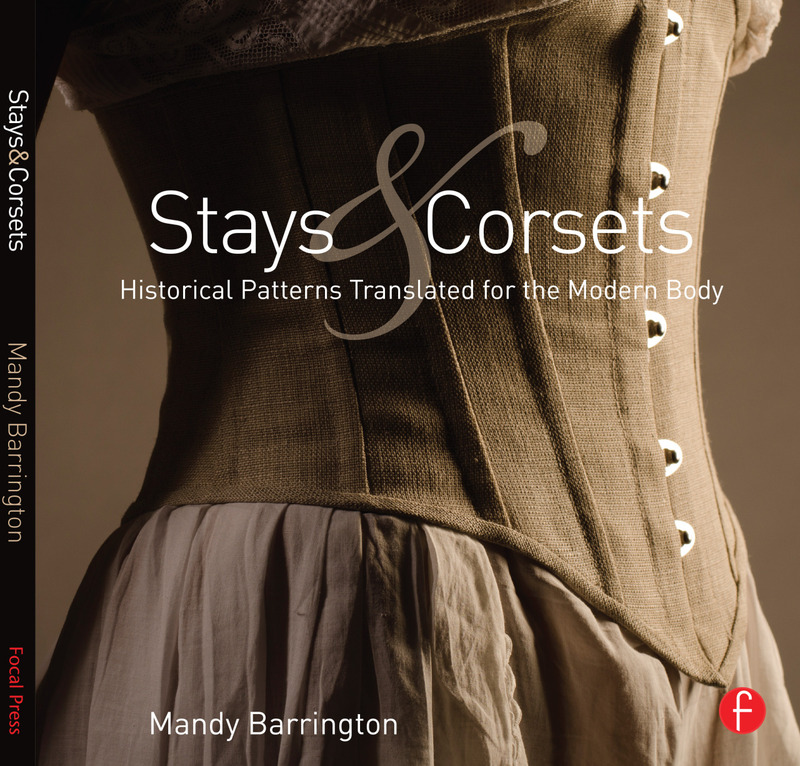 Just in terms of being a kind of corsetry bible, I would like to see strapless 18th century stays, an 1840 corset, an Edwardian corset, early 1910s corset, and a solid 1920s brassiere - but it says on Ms. Barrington's bio page that she's working on a second book, which I suspect will contain most if not all of these. I take issue with some of the more interpretive text regarding historical corsetry, and it's important to take Cathy Hay's findings about the importance of hip and upper back ease in corsetmaking into consideration when you scale up these patterns: the book tells you to expect reduction across the board, but you'll be more comfortable and achieve more waist reduction if you plan to get bigger in the other places. However, the system of drafting itself is very well explained and appears potentially adaptable to other patterns, such as those in Corsets and Corsets & Crinolines that don't appear here. This manual is probably best suited for people used to modern pattern drafting who need help shifting to historical silhouettes, and I'd also recommend it for people who don't know any way to make use of patterns from extant garments. If you fall into either of these categories, put this on your wish list! I have this book and find it to be very beautifully done. I also took issue with some of the text in addition to the interpretation of the 1793 short stays. I think it's just the way they were modeled, though. I borrowed this from a friend and made up the sloper and the 1785-1788 stays as a mockup. While I really enjoyed the process overall, it's VERY clearly written out and easy to follow, I had a few things I would change. She gives charts for reduced measurements - I went down because I was between "sizes", and she says that no seam allowances are included, so I added some. But the reduction was only a few centimeters, and it didn't compress or hold my figure at ALL, barely better than a tight t-shirt. I restitched using my pattern lines as edges (taking it in a bit more, I think I did a 1cm seam from there) and that was better, but that's as far as I got. I really did like that you get walked through a really detailed block and there's many options for silhouettes (she has a 1915 corset download available on the publisher's website), but personally I would either use even further reduced measurements or not add seam allowances.